We were enormously saddened to hear of Pete Hutchinson’s death. Founder of Mountain Equipment and later PHD, he was one of the most innovative of his generation with a deep knowledge of climbing and climbers, of down and garment design. Mike Parsons knew Pete throughout his career whereas I only met him in 2000. I was researching Invisible on Everest and Pete was on my interview ‘wish list’. I was lucky enough to spend two hours with him at PHD, his factory in Stalybridge and the interview had an enormous effect on me and on Invisible on Everest. He understood down, garment and sleeping bag design so well and was happy to talk, after gently reminding me that I had forgotten to switch on my tape recorder. One of his observations was that ‘the best gear was invisible’, allowing climbers to get on with the job. The beginnings of a title for our book was born. The following extract tells the story of some of his innovation and the respect he enjoyed among mountaineers. It was hardly a glamorous existence – he would clean out the cattle sheds to pay his rent and then go back to his tiny shack and make a jacket. But his down jackets and soon sleeping bags, produced initially on a bespoke basis, developed an enviable and justifiable reputation. Hutchinson was a good mountaineer and his hallmark was a craftsmanship which reflected a deep understanding of the demands placed on climbers at high altitudes and an empathy with his gear. He is one of very few designers to whom climbers have consistently paid tribute for over 40 years. The exceptionally good relationships he built with climbers brought commercial benefits too, for he got the earliest expeditions photographs, which he always used immediately in advertisements or catalogues. But, in the 1960s, before the expansion of winter climbing , winter walking and backpacking and skiing, there was not a bulk market for his down clothing and sleeping bags in a way that there was for rucksacks. Whilst he certainly would not agree that he was not pleased that Mountain Equipment grew, in some ways, Hutchinson was most comfortable with this position. He loved design work but disliked the rising tide of administration as the firm grew. He returned to his original specialist niche in the 1990s after Mountain Equipment went into receivership. He founded PHD in 1998– Pete Hutchinson Designs – and won a Millennium Design Council Award for his lightweight sleeping bag. ‘ I like to hear that the gear is good but the useful information for me is when the climbers come back and say, ‘It would work a lot better if …’. Reading the obituaries that have appeared this week it is striking that generations of top mountaineers have, over 50 years, benefitted from his careful design. 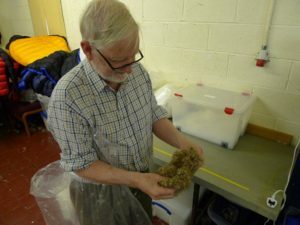 They stretch from Chris Bonington, Don Whillans and Doug Scott in the 1960s and 1970s through to Andy Kirkpatrick today. The climbing world would have been a different and much less safe place without him. He hated managing a large business but design returning to his roots with PHD. Good innovators appreciate how past experience and knowledge can inform and shape future innovation and that was true with PHD. In 2014 they revived Pierre Allain’s bivouac system. 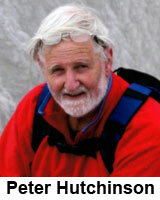 I feel privileged to have met him and sad that the outdoor industry has lost such a craftsman of note. Credits: Thanks to Pete Macfarlane for loan of photo of Pete Hutchinson examining down. 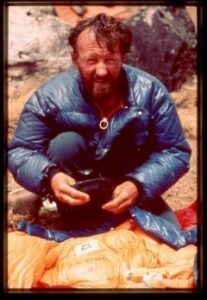 The thumbnail of Pete Hutchinson is from the PHD website and the photo of Don Whillans was loaned to us by Pete Hutchinson for Invisible on Everest. PHD revive 1930s Pierre Allain innovation.